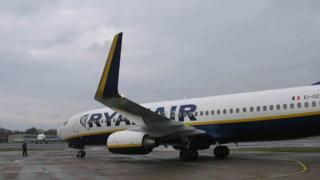 Ryanair has said that it has cancelled 20 of its scheduled 300 flights to and from the Republic of Ireland on Friday. The news comes ahead of a planned fifth day of strike action by Irish-based pilots at the airline. It said all 3,500 affected customers have been contacted and will be rescheduled on other flights or be refunded. Ryanair pilots in Germany also plan to strike for 24 hours from Friday. Late last year, the airline said it would recognise unions, however it has so far not agreed any collective labour deals with staff across Europe. The strike among pilots based in Germany will affect all flights from Germany, according to the aviation safety organisation, Vereinigung Cockpit. Ryanair said at the weekend that it is also cancelling 104 flights in and out of Belgium on Friday due to similar stoppages by Ryanair pilots in Belgium and Sweden. Its elected pilot representatives in Ireland have accepted the airline’s proposal for third party mediation, overseen by the former director general of the Workplace Relations Commission, Kieran Mulvey. Pilots have said that subject to rostered duties, they are available on 14 August, which they understand is the first date that Mr Mulvey will be available. Pilots’ union Fórsa said it “looks forward to talking to Kieran Mulvey about when a process could begin”, but Friday’s strike action looks set to proceed.